The Hessen Haus perfectly recreates the authentic atmosphere of an old-world German bier hall. The twenty-one imported German biers on tap, authentic German fare on the menu, and sounds of live music on the stage – including local bands and regional polka – create a lively yet cozy atmosphere where large crowds gather to pass the boot and small groups find themselves making new friends. A combination of a state in west-central Germany and the German word for house, the name Hessen Haus was chosen for its authentic origins and welcoming feel. The state of Hessen which the bier hall is named for plays home to more than six million inhabitants – which are referred to as Hesses if male or Hessins if female. In English, occupants are known as Hessians – a term affectionately applied to our more frequent visitors to the restaurant. Formerly an old train station, the building which houses the Hessen Haus has undergone numerous transformations over the years – playing host to a variety of restaurants, bars and dance halls – and nearly facing condemnation and destruction at one point. Early in its history, it even served as an open-air structure for housing horses. 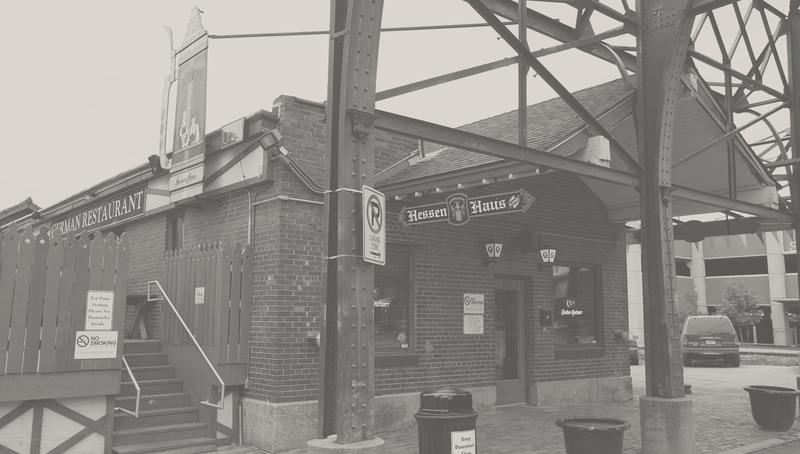 As part of their commitment to the history of the downtown area, the owners of the Hessen Haus worked to return the place to its origins by retaining as much of the original wood beam structure and sturdy brickwork when they renovated.